A study by Lembke et al., “Influence of Omega-3 (N3) Index on Performance and Wellbeing in Young Adults after Heavy Eccentric Exercise,” compared the Omega-3 Index of subjects with the incidence of delayed onset muscle soreness (DOMS), inflammatory biomarkers, and quality of life following vigorous exercise. 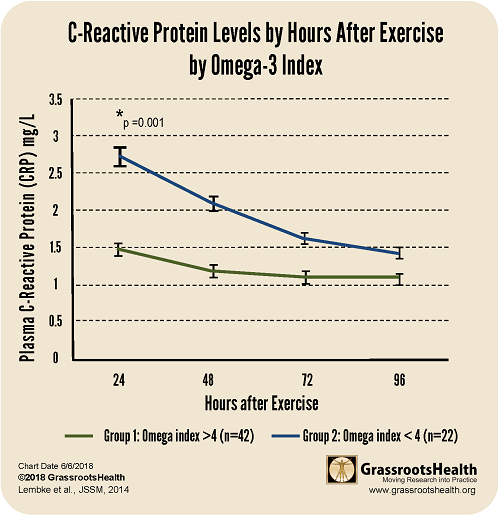 Plasma C-reactive protein (CRP) was measured as an indicator of inflammation at 0, 24-, 48-, 72-, and 96 hours post-exercise. The measurement of DOMS (mean worst pain score) was recorded on a scale from 0 to 10. At 24 hours, the average score for Group 1 was 3.81 versus 5.32 for Group 2. There was a significant difference in DOMS score at 72 hours with Group 1 reporting an average of 2.19 vs 4.36 in Group 2. The difference at 96 hours was also significant with Group 1 reporting an average score of 1.63 vs 3.17 in Group 2. Subjects in Group 1 also had lower blood lactate levels directly after exercise and reported improved overall quality of life as measured by a more stable mood at 72 hours as compared with Group 2. 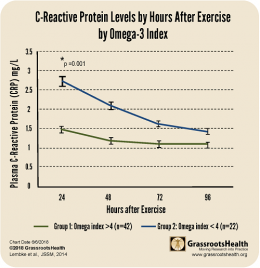 What is the connection between omega-3 and inflammation? Previous research has suggested that omega-3 supplementation may be protective against inflammatory conditions that have been linked with many chronic diseases, such as metabolic syndrome and Type 1 Diabetes.